From mining to sheep herding to becoming known as the next town down the road from Sun Valley, Hailey has seen its fortunes shift several times during the past 130 years. Hailey Historic Preservation Commission Chair Rob Lonning has published a book that tells the story. Using vintage photographs from the Hailey Library's Mallory collection and elsewhere, Lonning's book, "Hailey," is part of Arcadia Publishing's Images of America series. It will be available for purchase beginning April 23 for $21.99. The Malory collection was shot during the early- to mid-1900s by Hailey photographer Martyn Mallory. 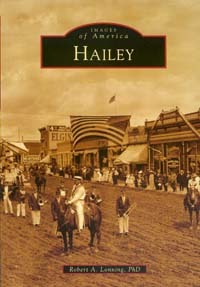 The book tells Hailey's history in pictures, captions and short essays beginning with the founding of the city in 1883. Stunning family portraits, parade photos and scenic vistas capture a town on the frontier that later became the biggest town in Blaine County. "In recent years, Hailey has reinvented itself yet again, with tourism as the mainstay of the local economy," Lonning stated in a news release. Lonning, 63, began visiting the Wood River Valley in the late 1990s and has lived in Hailey full-time since 2004. A retired teacher, Lonning's interest in Hailey history grew out of his work with the Historic Preservation Commission and involvement with the Mallory collection. Lonning is donating the proceeds of the book to the library's Mallory fund. "Hailey is a wonderful community with a proud history," Lonning stated. "Since the 1930s, however, Hailey has been somewhat overshadowed by its more glamorous neighbors to the north [Ketchum and Sun Valley]. "It is my hope that this book will help to illuminate that proud history for locals and tourists alike and help Hailey receive the recognition and appreciation it so richly deserves."